After I decide to write a particular nonfiction book, I'll spend many months, even years, learning about a topic before I write a single sentence of my own words. With nonfiction, a book is only as good as the research behind it. 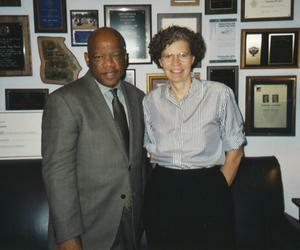 Scenes from on-the-road research: for Freedom Riders with history-maker John Lewis at his Congressional office in Washington, D.C. When I do research, I assemble my own personal library about a subject. For example, when I studied women's voting rights in With Courage and Cloth I started by reading what scholars of history had written about the topic. I read what suffragists, the women who fought for the right to vote, had written about themselves, too. 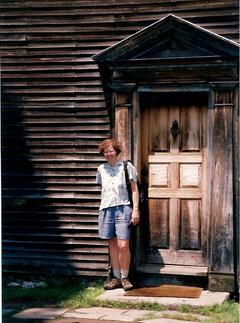 I visited places that mattered to them, like Seneca Falls, New York (and its National Historic Park). I studied photos about woman's suffrage, especially ones from the historic collections of the National Woman's Party and at the Library of Congress. I filled hundreds of notecards with facts about this history, pieced together a chronology of important events, and collected snippets of historical detail that appealed to me in particular. After spending more than a year on such work, I began to wonder if I would ever be done. But I knew I couldn't start writing until I understood my subject backwards and forwards. All the details had to make sense, and the "Big Picture" needed to come into focus. … for Our Country's Presidents at the birthplace of John Adams in Quincy, Mass. As much fun as the research can be, the writing is just as rewarding. By the time I start writing, I have a clear outline of what I want to say, reams of supporting facts, and photos that help me visualize the history. Notecard by notecard, page by page, I transform the knowledge I've collected into the story I want to share with others. I know some writers who write their first drafts out longhand, then type them up later. But I like to compose right at the computer, moving my thoughts around and doing simple edits right there on the screen. Then I print out my work and revise it by hand. Revising might be my favorite part of the writing process. No matter how good something might seem when it's first written, it just gets better and better with revision. I'll take my first printouts through several sets of revision before I end up with what to me is a first draft. This draft goes through more revision before it makes it to my editor as the first draft she sees. 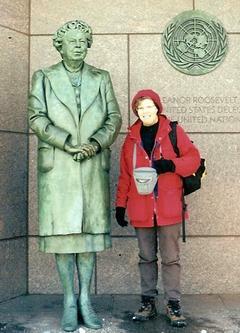 … for Our Country's First Ladies with Eleanor Roosevelt at the Franklin Delano Roosevelt Memorial, Washington, D.C. It's always a thrill to begin collaborating with others on a book. Until then I've worked almost entirely alone. I might share little stories of what I'm doing or what I've learned with family and friends. Members of my writing critique group may review early drafts of chapters, too. But by and large I keep my work, especially my words, to myself until I'm ready to share them with my publisher. By then I've made the work as good as I can without the help of fresh eyes. Jennifer Emmett, my editor at the National Geographic Society, brings that fresh perspective to the task. She and her colleagues always have good suggestions to offer on how to make my work better. Inevitably there is rewriting to do, and inevitably the text becomes stronger and stronger, closer and closer to becoming worthy of publication. Once the text begins to settle into somewhat of a final form, we begin production. 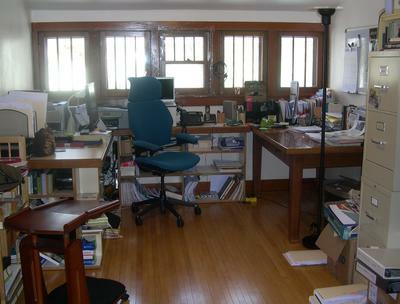 I go from the solitary life of a writer to the bustle of a virtual office, complete with ringing phones and ping-ponging e-mails. Nothing is more satisfying than receiving that first set of page proofs where typeset text merges with illustrations and my project begins to look like a book. Then we polish, endlessly it seems at times, until my desk sags under layers of proofs, each one a little bit closer to the finished look of the book. … at Seneca Falls, N.Y., for With Courage and Cloth. Often I play a leading role in finding the photos that illustrate my books. This is a job unto itself, and it's one that begins almost as soon as I start work on a new project. Whenever I read, I take note of photos that I like. When I travel, I visit archives, libraries, and museums with collections of photos on my topic. I collect photocopies, written descriptions, even finished prints or scans of possible illustrations. At the same time that I'm writing and revising my text, I'm evaluating my photo resources, highlighting favorite images that best support the text, searching for extras if there are gaps in what I've already found. All of this work goes to my publisher, too, and receives the same sort of helpful criticism that I gain for my text. 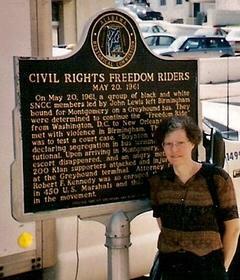 … in Montgomery, Ala., while researching Freedom Riders. By the time the finished book arrives, there are few surprises. I've read the text so often that it's nearly memorized. I could recite the order of the photos in my sleep. I've seen the design, the colors, the jacket in frequent proofs. Still there's a wonderful sense of satisfaction, relief, and peace when I crack open the covers of the first copy of a finished book. Chances are I've already started another project by this point. I may not have written a single word yet, but my mind is brimming with ideas, images, facts, and visions for the form this new work will take. As much fun as the last phase—and the last book—have been, the unknown of what lies ahead is best of all. My home base for writing. If you explore my book's individual pages, you will find more stories about my research and writing process. Or, you may clink on a link, below. Then, click Behind the Scenes in the right-hand column under EXPLORE.